Here is an some of our newsletters. The new format for our newsletter. 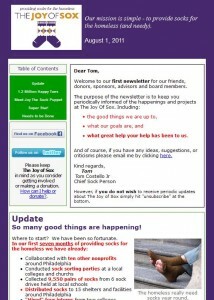 Newsletter August 1 2011 The Joy of Sox – providing socks for the homeless. Meet Joy The Sock Puppet. She is our official Spokes-Puppet. Super Star Volunteer. Ciarra Karnes. What we need help with. Any suggestions appreciated.